I have been very lucky to be contacted from time to time by people who read my blog posts. These messages to me are often very helpful and sometimes quite enlightening. This story describes one of those very cases, both helpful and enlightening! On September 17 (with an update on September 19), I posted one in my series on Researching Photographers in the South, this time on Texas. I try to use photographs from my own collection whenever it is appropriate, and in my post on Texas photographers I used the image above of Mrs. T. P. Atkinson made by Blessing & Bro. of Houston. 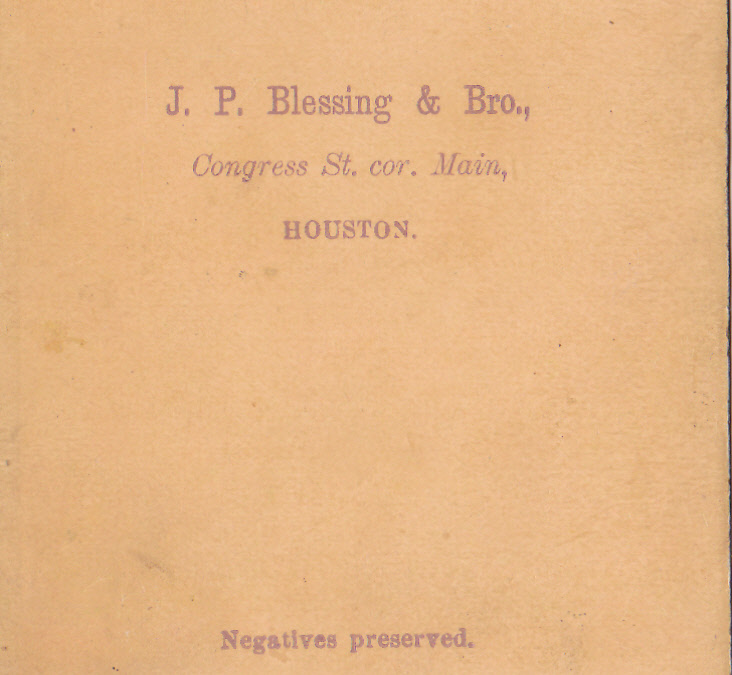 Immediately after the war John P. and Solomon T. Blessing advertised as artists and operated photographic galleries in both Houston and Galveston. They offered photographs made by many processes, including paper prints finished in oil, pastel, or watercolor, and a large assortment of photographic supplies, which they attempted to keep up to date with the rapid technological advances in the field. Among their Galveston employees were P. H. Rose and portrait artist Louis Eyth. Solomon succeeded him [Samuel, d. 1897] as manager of the business. John did a number of views of Houston buildings that were lithographed by W. H. Rease of Philadelphia and included as vignettes around W. E. Wood’s map of Houston, published in 1869. This gentleman, my contact, initially wrote to me because of a resemblance he saw in my carte of Mrs. Atkinson to a photograph he has of the actress and Confederate spy, Belle Boyd. With his letter, he sent me a photocopy of the Boyd photo and mentioned that he thought both women appear to have fake hair, or at least hairpieces, something I had not thought about, and that they both are posed so similarly. It seems that “my” Mrs. Atkinson went to the doctor for some “female problems”, and although she had been examined by the doctor in her own home, a boarding house, Dr. Riddell wanted to do an examination at his office, so Mrs. Atkinson went there for her next appointment. As you may imagine, the doctor was interested in Mrs. A as more than a patient and began fondling her. She resisted his advances and ran out of the office crying, or that is how it happened according to her trial testimony. She told her landlady about the incident, and she finally told her husband, Thomas. One thing led to another and although he and the doctor had seen one another on the street, a few days later Atkinson encountered the doctor for the last time. He not only stabbed, but he shot Dr. Riddell. The doctor was, of course, a family man (his family lived in the home where his office was! ), and he was prominent in the community, and he had a very good reputation in the city of Houston. Many people said they did not, could not, believe what Mrs. Atkinson said the doctor did. My contact believes that my carte of Mrs. Atkinson was made at this time in 1872. She was “in the news” and it certainly seems quite possible that the photograph dates from this event. 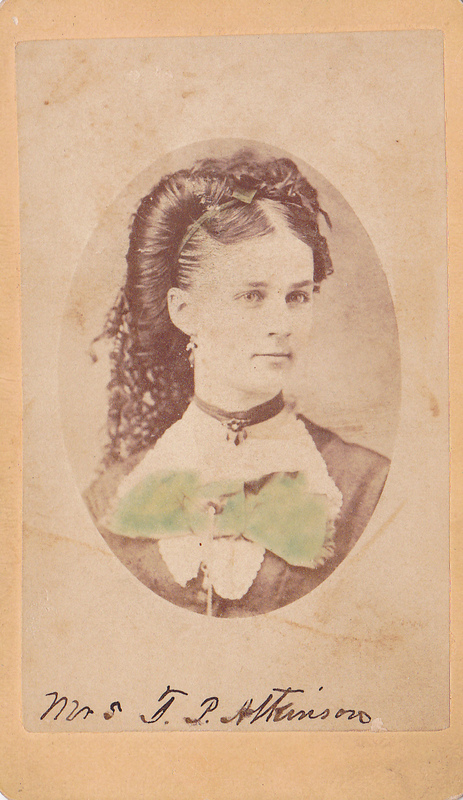 The photographer(s) depicted her as a very attractive, but demure, married woman. And now we know that Thomas and Leona Atkinson, married only a year, came to Houston less than a year earlier, in September 1871. The link for the Houston newspaper account of the trial from Thursday, May 30, 1872 is below. See page 7, column 2, paragraph 2 for Mrs. Leona Atkinson’s account of the event that lead to her doctor’s death. There also accounts from witnesses. I’m sure there are other articles on this event to be found here in these newspapers via The Texas Portal History site. Later accounts report that Mr. Atkinson was acquitted on June 28, 1872, so maybe the Atkinsons lived happily ever after, maybe not. That research is for another day. It is wonderful to find out about the people in the photographs you own, whether those personalities are from your own family or someone else’s. It adds much to the intrinsic value of the item, but it happens all too seldom. Best of luck in your hunt for such choice information! ← Mirror Image – It’s My Blogiversary!